The first female bomb disposal specialist joined the Israel Police Monday, after completing a grueling 10-month training program that included operational exercises, theoretical studies and field work. Inbal Gawi, 26, completed the prestigious course alongside 14 male cadets. After a graduation ceremony that took place at the bomb disposal training center in Beit Shemesh, Gawi told Ynet that she decided to become a bomb disposal specialist because she wanted "to do something challenging and different." The newly-minted sapper said that when it comes to bomb disposal, men and women have the same fears. "I wasn't treated any differently," she said. "The commanders expected the same of me as they did of the others. Nevertheless, I still felt that as the first woman that completes the course, I had to prove myself. "At first I wanted to break the limits, mostly for my own sake, but now I feel like I did it for other women as well," she said. This is not the first time that Gawi faces a perilous role; she served as a combat soldier with the IDF's Karakal Unit. The Haifa native is to begin serving with the Givatayim police. As part of her job, Gawi is expected to respond to a variety of incidents where bombs are suspected to be involved. This includes the neutralization of booby-trapped vehicles and other suspicious objects. 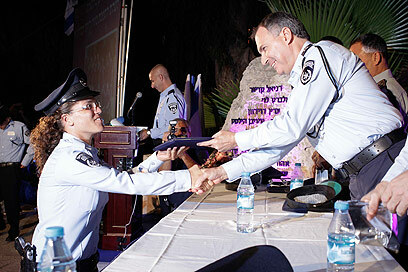 See all talkbacks "Israel Police get 1st female sapper"